I picked up this S50B30US (S50) several months ago, and for the most part it has been resting on an engine stand awaiting its future home in my ’95 BMW M3 track and race car. I have been spending a few hours here and there tinkering on it, cleaning up, getting some new parts on it. Still quite a bit to go, but it’s already a vast improvement. 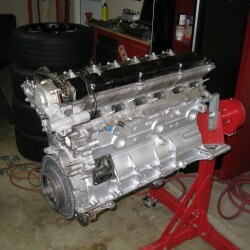 The main objective with this engine is to have as reliable as possible service as possible. 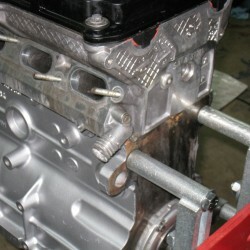 That means upgrades to both oil and coolant cooling and protection from oil starvation from high g-loads. It also means being able to monitor the engines vitals through a whole host of sensors and gauges. Next I removed the old aluminum thermostat housing, which had been tapped for a sensor, and replaced it with a fresh one. 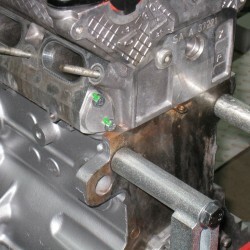 The factory uses a plastic housing, which are prone to cracking and leaking. This aluminum housing required a little bit of clean up to remove and smooth the casting flashing from the water ways. Quick work with a Dremel sanding drum. The engine builder had been running an electric water pump, so the supplied thermostat was welded open. I replaced it with an OEM thermostat and new o-ring. As I mentioned, the previous owner had run an electric water pump. 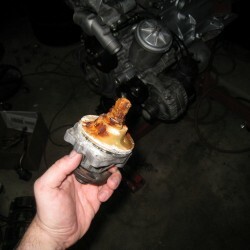 So they had cut the impeller off of the water pump. The result was a lot of rust, which had worked its way through the water jacket. 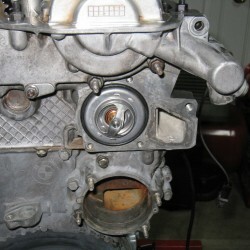 With all the plugs removed, I blasted most of the rust and dust out of the engine with compressed air. 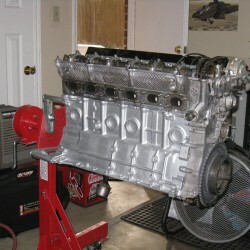 I replaced the old pump with a Stewart all-metal heavy duty water pump, a very popular upgrade for M50-based engines. 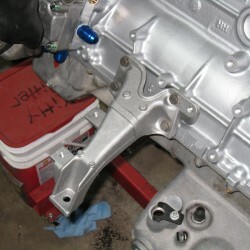 Here you can see the new pump and thermostat housing installed on the left. On the right you can see a new aluminum pulley. The stock pulley is made plastic and has potential to crack. I’ll be running an electric fan, so no need to mount a clutch to the front of the water pump, so a black anodized aluminum nut protects the threads of the pump shaft. The M3 won’t be running AC or heat, so I removed the heater port and replaced it with a simple aluminum block-off plate and gasket. Now for the oil system. The Euro-spec engines and the S54 both have provisions for oil coolers, coming stock with oil coolers (such as my M Coupe.) There are a few different options to add an oil cooler to the S50US engine. 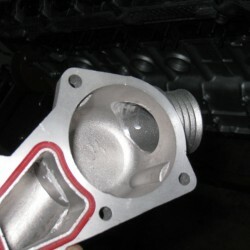 Because the M50 family of engines have so much interchangeability, you can actually install a European (or S54) oil filter housing onto the S50/52 block. This will give you ports for an oil cooler, but that’s it. It’s also a fairly expensive option. The cheapest option is a simple filter cap replacement for one that has ports. I didn’t care for this option, since it means the hoses run to the top of the filter cap, likely putting them in the way. 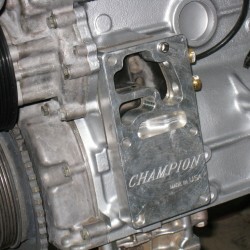 I then found another option, the Champion oil filter housing sandwich plate. The benefit is it offers even more ports. There are three 1/4″ NPT ports for gauges (marked for pressure, temperature, and auxiliary.) 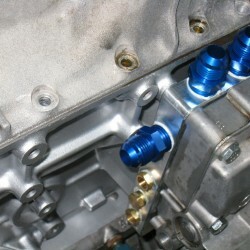 There are also three 1/2″ NPT ports, two for your oil cooler out/in and one for an Accusump oil accumulator. The plate simply sandwiches between the stock filter housing and the block. 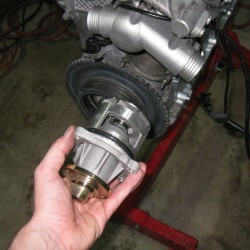 Longer bolts and two gaskets are provided, as are 1/4″ to 1/8″ adapters for gauge senders. I added -10AN male fittings to the 1/2″ NPT ports. Everything sealed up with Permatex high-temp sealant. Since the engine had been involved in a hard wreck, it had shattered its passenger side mount. 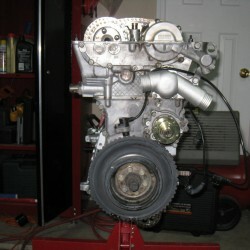 I replaced it with a solid junk-yard mount, cleaned up with a lot of carb cleaner. Originally I thought the driver’s side mount was fine, but after a thorough cleaning I discovered several hairline cracks. 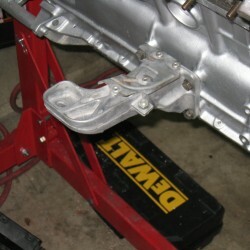 The driver’s mount is very inexpensive new, so I replaced it with a new OE part. That’s it for now. Still lots of work to do. The headers are off getting ceramic coated. 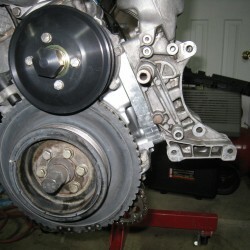 The wiring still remains, the cooling lines, and of course the flywheel and clutch and mounting the transmission.